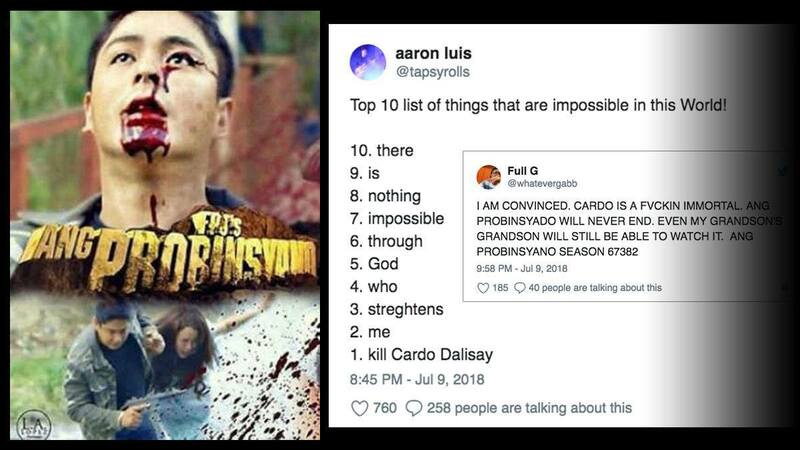 Fans were shookt when Coco Martin's lead character Cardo met his end in a recent episode of Ang Probinsyano. Well, joke's on everyone—except for leading lady Alyanna, played by Yassi Pressman—because, in the words of Nelly, "It was only just a dream." She had a nightmare about them being chased by Marco's (JC Santos) gun-toting henchmen and Cardo seemed bulletproof for about six and a half minutes. The country was ready to mourn the long-overdue demise of its beloved protagonist until the sight of Alyanna waking up in horror confirmed Season 50 of the action drama. His name easily topped Philippine trends and was among the most popular worldwide topics on Twitter, with almost the entire population freaking out over what had just happened. Along with the endless tweets on the showrunners causing fans to hold their collective breath, memes poking fun at Cardo's "immortality" took over social media.